The Green Belt Movement (GBM) was founded by Professor Wangari Maathai in 1977 under the auspices of the National Council of Women of Kenya (NCWK) to respond to the needs of rural Kenyan women who reported that their streams were drying up, their food supply was less secure, and they had to walk further and further to get firewood for fuel and fencing. GBM encouraged the women to work together to grow seedlings and plant trees to bind the soil, store rainwater, provide food and firewood, and receive a small monetary token for their work. 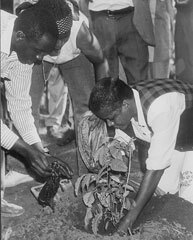 Shortly after beginning this work, Professor Maathai saw that behind the everyday hardships of the poor—environmental degradation, deforestation, and food insecurity—were deeper issues of disempowerment, disenfranchisement, and a loss of the traditional values that had previously enabled communities to protect their environment, work together for mutual benefit, and to do both selflessly and honestly. The Green Belt Movement instituted seminars in civic and environmental education, now called Community Empowerment and Education seminars (CEE), to encourage individuals to examine why they lacked agency to change their political, economic, and environmental circumstances. Participants began to understand that for years they had been placing their trust in leaders who had betrayed them and that they were sabotaging their lives by not working for the common good and failing to use their natural resources wisely. Consequently, the Green Belt Movement began to advocate for greater democratic space and more accountability from national leaders. It fought against land grabbing and the encroachment of agriculture into the forests. It contested the placement of a tower block in Uhuru Park in downtown Nairobi and joined others to call for the release of political prisoners. In recent years, it has extended its reach internationally to campaign and advocate on climate change, the importance of Africa’s rainforests in the Congo, to initiate the mottainai campaign—an effort to instill the notions of “reduce, reuse, recycle” in Kenya and around the world—and has partnered with the United Nations Environment Programme (UNEP) in its Billion Tree Campaign. After being awarded with the Nobel Peace Prize in 2004, Professor Maathai’s profile and that of the Green Belt Movement were raised worldwide. Prof. Maathai was appointed Goodwill Ambassador for the Congo Basin Forest Ecosystem, the world’s “second lung” after the Amazon Rainforest. Her four books (The Green Belt Movement, Unbowed, The Challenge for Africa, and Replenishing the Earth) and the documentary Taking Root: The Vision of Wangari Maathai expanded on and deepened the key concepts behind the Green Belt Movement’s work and approach. The work of Professor Maathai and the Green Belt Movement continues to stand as a testament to the power of grassroots organizing, proof that one person’s simple idea—that a community should come together to plant trees, can make a difference. Her legacy truly lives on through the Movement which to date remains in the frontline of advocating for environmental conservation in Kenya, and making great progress on reclaiming and restoring forest land. The Movement continues to expand its horizon to include community development work encompassing the arenas of environmental conservation, democracy, community empowerment and conflict resolution, as Wangari envisioned.